Relieving stress. Learn how to cope with the challenges of pregnancy. Connect with baby. Learn how to get your body and baby in sync. Prepare for labor and delivery. Learn the secrets of a happy birth. You'll be invited to Sweet Momma Yoga's closed group on Facebook! Enjoy connecting with other local women as they venture into this rite of passage of motherhood at the same time as you! Buying a 6 Week Session for someone else? Check out the benefits of Prenatal Yoga here. Studios typically have: thick bolsters, blankets, blocks, straps and mats. (For hygienic purposes we encourage you to bring your own sticky yoga mat.) If you have any props at home, please bring those with you... eye pillows are wonderful! Wear comfortable, breathable clothing. Layers work well in the cooler months. The room is set at about 70 degrees. Traditionally yoga is practiced on an empty belly (refraining from meals 2 hours before practice.) This is not the case in Prenatal Yoga. You are creating a little human, please eat. Perhaps not a chili cheese dog right before class, but eat lighter foods like fruit, vegetables, crackers, small sandwich, etc. You want energy for the class... and it's a great way to prepare for labor. It can be helpful to eat before and during childbirth to keep your energy and strength going. Most importantly: please do not leave early. Allowing time for a restorative pose often followed by a guided meditation or breathing exercise seals the work you have done. Becoming aware of your body, mind and breath is our goal to assist you through childbirth, and into parenthood. Embrace the moment of stillness. If you're a current participant and the estimated due date is in the midst of the next session: reach out via email to your teacher to save your spot and continue to receive the discounted session rate. Please wait until after the first trimester before starting a new program, like yoga. Click the 'Sign Up' button to view pricing details by creating an account. Each yoga session (often six-week sessions) repeat weekly at the same time and day indicated for the specific class. When the session concludes a new session will likely begin right away. Participants are encouraged to register for subsequent sessions until baby arrives earth-side. We LOVE receiving birth announcements! Please send one over! What's better than pictures?! 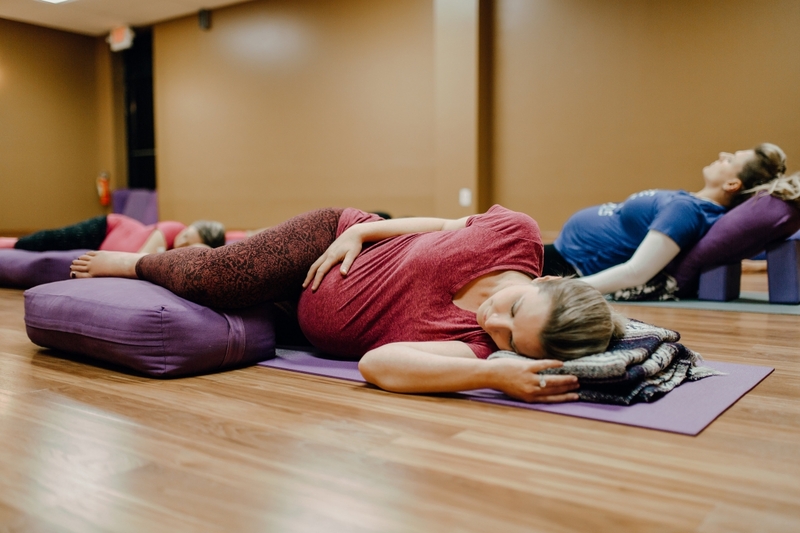 You (with your baby) returning to Prenatal Yoga for a visit and share! Tell future mommas your experiences of labor, birth, and being a new mom. You'll have about 5-10 minutes to share and answer questions. It's a gift to retell your story, as it shapes your perspective of the birth, and influences other moms' choices leading up to the big day. Join 'Me Time' Momma Yoga and/or Momma & Baby Yoga. You'll enjoy re-visiting with past Prenatal Yoga mommas! "I actually remembered something Elise said which helped me deliver, I encountered some difficulty at the end while pushing then I remembered Elise saying remember to relax and relieve some tension while in labor as soon as I recalled that I was able to deliver my son out in a few pushes." "Thank you for a wonderful prenatal yoga experience. I was a bit apprehensive about taking yoga because I hadn't started earlier. Your breathing techniques as well as birthing positions guided me greatly during my labor day. It eased my labor process and I swear by it now." 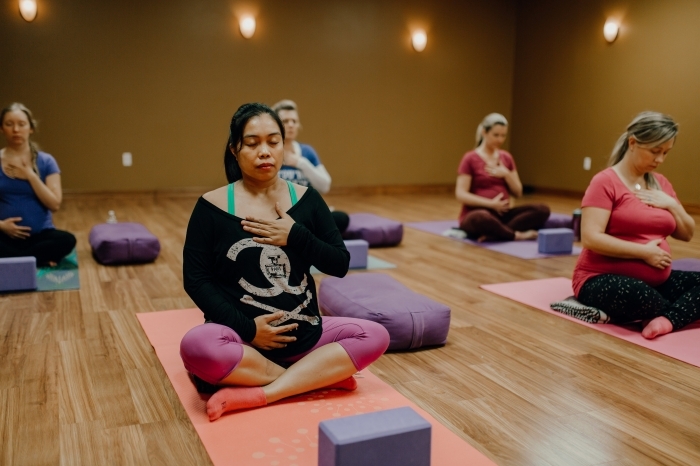 "Elise's prenatal yoga class was my first experience with yoga... This yoga class had an enormous impact on the day of my daughters birth, and for that I am forever grateful to Elise. I recommend her class to everyone!" "I have a new found love for this community and pregnancy - which I never knew existed. Thank you! You have changed and deepened my perspective." "I truly loved and looked forward to this class each week. It really helped me relieve stress and focus on baby while preparing my mind and body for birth." "Thank you for everything! It has truly been such an amazing experience. I remember you saying to me that this was my journey and I just needed to accept whatever baby was going to do. Those words rang in my mind and helped me embrace everything." Checkout more reviews on Google. Many prenatal yoga classes are now available in the Metro Detroit Michigan area convenient to your location. 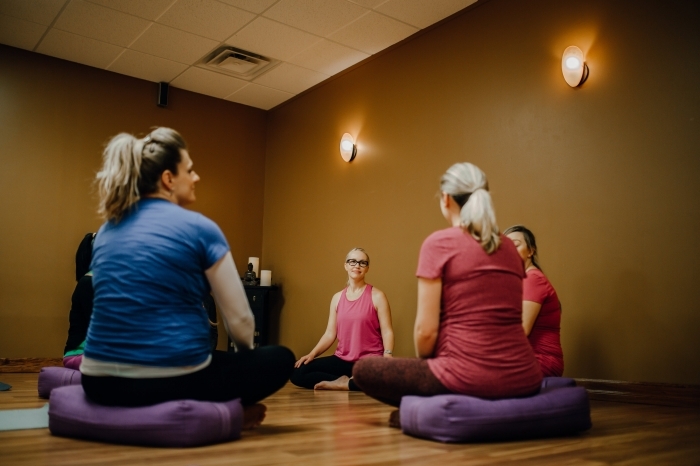 You can find yoga classes near Bloomfield Hills, Livonia, Birmingham, Keego Harbor, Northville, Farmington Hills, Redford, Canton, Plymouth, Novi, Waterford, West Bloomfield, Sylvan Lake, Commerce, and Auburn Hills.